Construction on the St. Joseph House of Faith in Action has been steadily proceeding since breaking ground on Sept. 22. The house, located at 457 W. Fourth St., will soon be home to two Gannon faculty or staff members who will sign a temporary lease as they prepare to purchase a home in the Our West Bayfront (OWB) neighborhood. Alongside the two bedrooms for faculty members, the St. Joseph House will contain space to host groups who choose to complete service in Erie. This may include groups from Gannon as well as other university or community groups who are in the area to take part in community service projects. Applications to live in the St. Joseph house opened to faculty and staff at the beginning of April. Two information sessions were held in the past week on campus for those interested in applying. The house will be furnished by the university prior to employees moving in. Those selected to live in the house will have potential duties reflective of home ownership. These may include mowing the lawn, shoveling snow, cleaning the house, preparing the home for visitors and resetting the home once visitors have left, and serving as the site contact for volunteers and introducing them to the community. Although the residents of the St. Joseph House will be expected to introduce the groups to Erie, they will not be required to accompany them during all of their activities. The employees will meet regularly with Gannon staff to provide feedback on hosting, facilities management and programming. The Center for Social Concerns will take responsibility for connecting with community partners to host volunteers and process special requests. While the Gannon employees are residing in the St. Joseph House, they will be expected to develop a plan to purchase a home in the OWB area. Erie GAINS and Community and Government Relations will be working with local banks to understand products available to support homeownership. 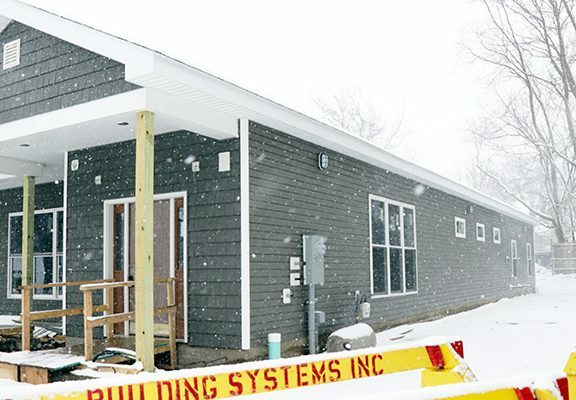 The build of the St. Joseph House has been supported by volunteer efforts. 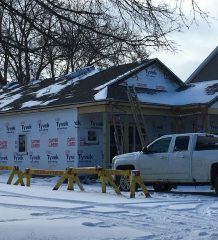 According to Erika Ramalho, director of Community and Government Relations, groups including Delta Sigma Phi, Habitat for Humanity and the staff of the Recreation and Wellness Center have contributed their time to the project. JT Koch, a sophomore finance, management and entrepreneurship major, volunteered with the Delta Sigma Phi fraternity to hang drywall and said the experience was worthwhile. Construction on the home is anticipated to be completed in May, and the university is in the process of planning a dedication and blessing ceremony. Volunteer slots will be open until the first week of May. They run from 8 a.m. to noon and from 1 p.m. to 4:30 p.m. on Tuesdays and Fridays. Those interested in volunteering should contact Joseph Mokwa at mokwa004@gannon.edu or sign up at www.getconnectederie.org. For more information about applying to live in the St. Joseph House of Faith in Action, please contact Ramalho at ramalho001@gannon.edu.